Some years ago I had begun a thread about Spies and more information. While browsing some listings and my own eagle files, I had been prompted to better understand the relationship between Birmingham agents/blades, the Wolfe family of New York and later marked blades by Spies. I came across an old obituary for him from the New York Times and I am attaching that. 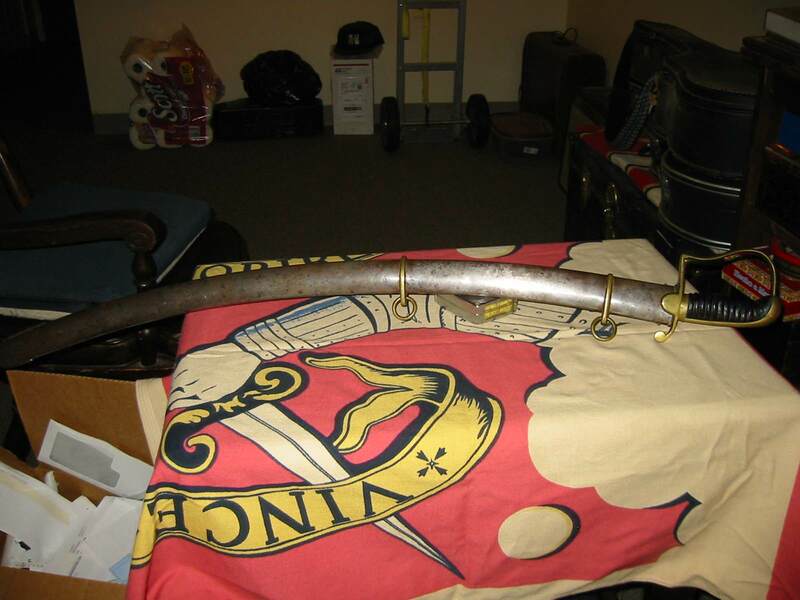 Also images of a pie crusted slotted hilt Osborn weeper. What started the gears going again yesterday was seeing a nice spadroon with all the Birmingham decoration traits that included his name in the blue and gilt. It was a bit of an odd day of researching and kept bumping into work by both the Wolfe family and Spies marked blades, so went on to do a little more poking about when I found the Times obit. What I haven't found yet is his puportedly published autobiography which would probably answer a good many of my other questions and interest in the two families. Some sword references seem to have the connections a bit messed up and the obit sums up a lot of answers in a few lines of history. 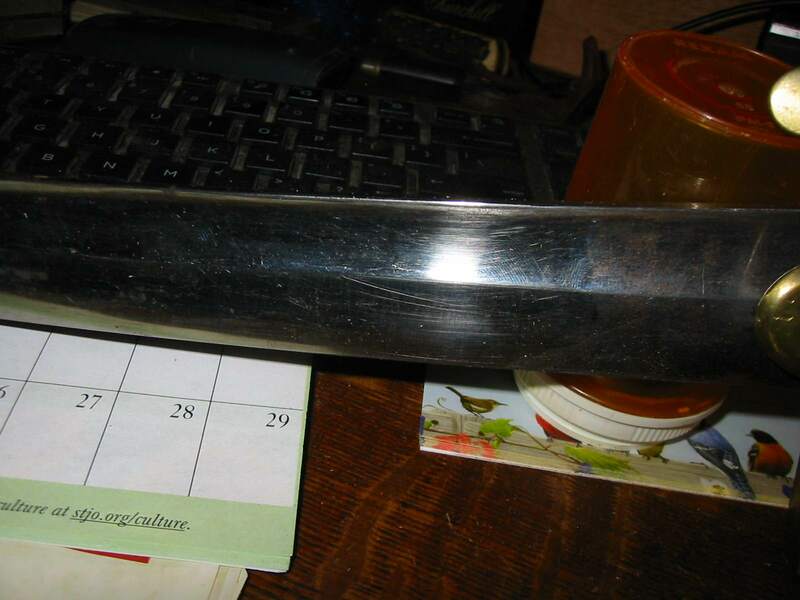 I think I have pictures of the first sword I was regarding of Spies in that old thread but the image links I had hosted back then are gone (and dead links edited out more recently). The Pie crusted slotted hilt also has me now quite dizzy in thought regarding dating both weepers and slotted hilts. Was there an elder A.W. Spies we are maybe overlooking? Last edited by Glen C.; 07-27-2010 at 09:33 PM. Ok, consider my ribs bruised! Nice information about Adam. But it doesn't mention any sword trade--was he not engaged in that business--do I have him confused with another of his family perhaps? Well Tom, the sword pictured and the blade marking are the real (date and person) confusion in my mind. However, you may note the Wolfe marked blades and the apprenticeship of Adam with the Wolfe family. Then his being sent to Birmingham as an agent for them as a young man. That is just a paragraph or two of the obituary relating association with the sword business but would certainly point to that man being the sword purveyor (and hardware)The obituary relates his business as a hardware proprietor. In my 2005 thread (as mentioned the pictures are gone), researching I had done then again showed him active as a shop owner and the B&G blades of Birmingham marked to him within the decoration of B&G. I had first come across the fire dept association in finding old insurance papers, as he also issued fire insurance policies. From there I had found some tax records of the hardware store/business. I have to see that as diversity, as he also sold firearms. 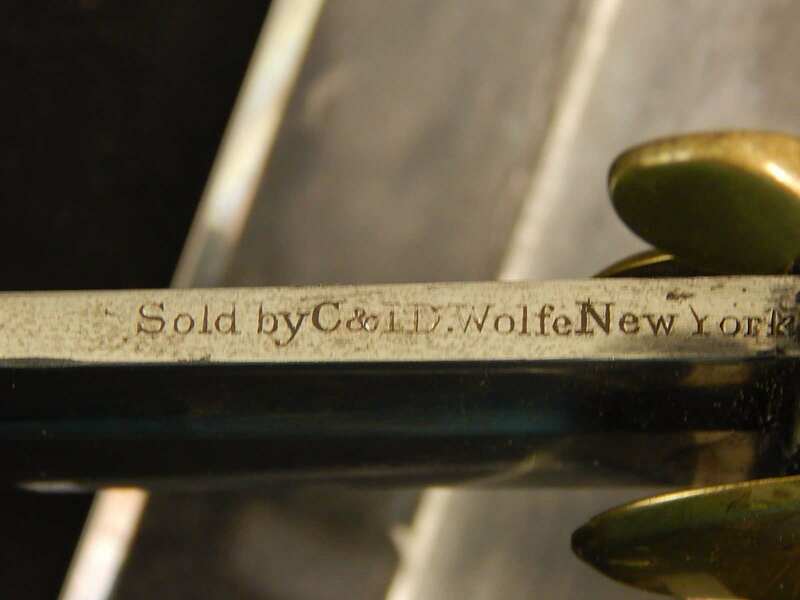 A sword related reference when finding that B&G 1796 sabre with American grafitti and spine marked by the Wolfe bros also included a blurb of a sister or daughter marrying Spies. That is the other possibility we may be looking at two different people but two Spies working with Wolfe? Two A.W.Spies working with Wolfe? Thus my random thought that his father may or may not have been the other A.W.Spies responsible for the pie crusted Osborn. The Wolfe marked blades are turning up with some frequency over the past few years and some have speculated the mark as false but that would make a fair number of students reading them right when wrong. Here is that Americanized 1796. The Osborn eagle type shown above is of an earlier pattern but I have seen some eagles and others marked from Wolfe that could certainly be later than the war of 1812. I can only suppose that as an apprentice or early independent, some of these spine marked Spies. 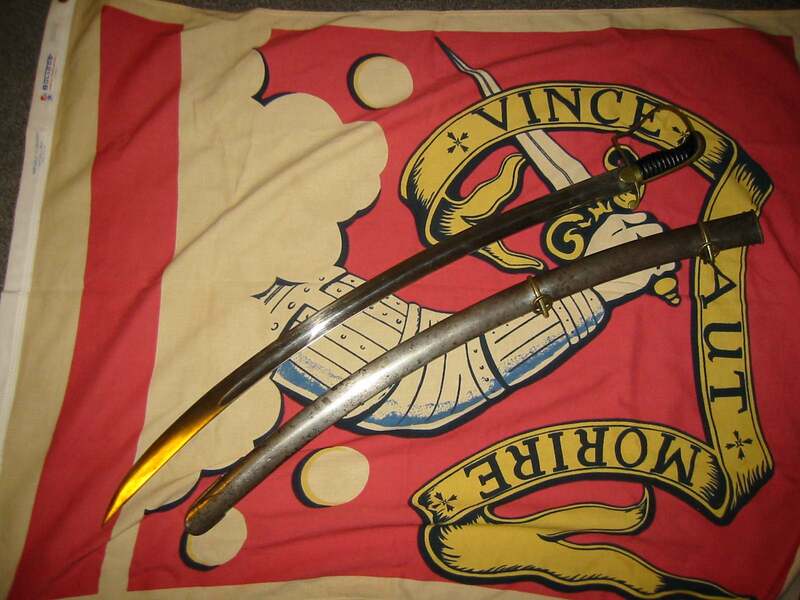 The Wolfe swords have all shown up as Birmingham types such as that sabre and the urn pommel nco type of short sabre that turn up more frequently. Somewhere here I have a Ketland style eagle marked by Wolfe and just adds more conclusion that the Wolfe family was quite active in importing swords from Birmingham. I presume the B&G decorated to Spies has passed through the auction halls by now but am only going to post one picture of that now and offered here only to show B&G that really must have been done in Birmingham, as opposed to in house marking later vendors such as Horstmann was etching. Well, ok two pictures. The other to show the later eagle variant note. Stumbling through my notes also have me wondering about some later swords marked to Spies bing much more in the vein of the Solingen imports. PDL and Weyersburg blade marks might confirm that for me. I really want to find Spies autobiography and that might put some of my other speculations to rest. I would be glad to hear or read any more insight that article may share. More of what I am regarding as conflicting information by arms collectors and in regard to the obituary. While the following is not attributed to the MAA article, I wouldn't be surprised if that was copied/drawn from that. Adam W. Spies & Co, importers of military goods about 1830 maybe earliers, originally from Birmingam established offices in New York and became spezialized in firearms about 1850 or earlier. He is considered as Maker of Deringer-Style Pocket Pistols. But as he already did on flintlock guns, pepperboxes and shotguns of other manufacturers as Allen or Miller, J. & J. it is most likely that he stamped them with his name. A partnership was made with Frederick Kissam about 1867. Spies, Kissam & Company figured until 1875 in the Trow's New York City Directory. In his early years his signature figuers on swords and military buttons. In 1864 Adam W. Spies figured as manager of Demilt Dispensary, Incorporated in March 1851. And (when?) he was president of the Stuyvesant Insurance Company. Furthermore he was member of the NY Fire Departement Engine Company No. 5. Blunderbusses, Muskets and Pistols marked A.w. Apies are stipulated in the Reilly Papers, Inventory of the Louisiana and Lower Mississippi Valley Collecions, Special Collections, Hill Memorial Library, Louisiana State University Libraries, Baton Rouge, Louisiana. So, the question still remains in my mind is if the elder Spies was marking blades on the spine. I am encountering several. 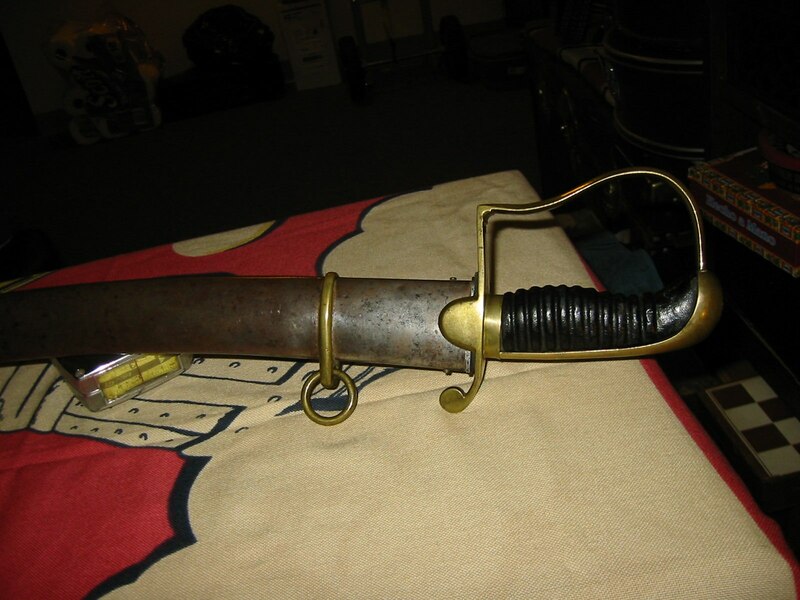 Donnelly has an example up of a 1796 type sabre with the early mark and pcay has a later etch type from the '40s or so. I have those but as objects of sale, will not post them up. Bill, with printed billhead, from A.W. Spies & Co., importers of hardware, cutlery, guns, pistols, rifles, New York, Jan. 15, 1848, for watch parts. Last edited by Glen C.; 07-30-2010 at 09:08 AM. ".50 calibre Percussion Pistol, A.W. Spies, New York, N.Y. Circa 1835"
Thanks for posting all this information and great photos, Glenn and others. I will keep watching this thread. I am new more or less to eagle heads and they are appealing to me. Well, back from other thoughts and regards, I have picked up the Peterson tome to read the "makers" blurb there. I also just looked through Bezdek's 1812 and although he lists all the Wolfe's, he does not regard Spies at all except (somewhat ironically) picturing a hilt type tied to Spies marked Birmingham swords and that on the inside of the front board of the book. This is transcribed from Peterson's The American Sword, 1775-1945 (pg 267 of the makers directory in my edition). Editing to add that there are several swords in Peterson's book either marked or attributed to Spies. Dealer in swords, firearms and general hardware, New York City, from 1821 till after 1851. He is first listed in the city directory of 1821 as a merchant at 87 Maiden Lane. Then he disappears from the directories until 1833 when he appears as "Spies, Adam W., hardware 192 Pearl Street". In 1834 his listing is changed to "hardware and military goods store". In 1839 it becomes Adam W. Spies & Co. IN 1840 he moved to 218 Pearl Street, and in 1846 to 91 Maiden Lane. He is omitted from the directory of 1848, but is back again in 1849, 1850, and 1851. He died in 1860 and was presumably active until that time. This, combined with other data that continues to be compiled really does look like discrepancies in the flow of the history due to combining more than one generation's information on biographies. Rather than form a definite conclusion on the timeline of swords (such as the Osborn type slotted hilt example shown) the thoughts posted here and inquiry continues to be one of discovery that the Times obituary pretty much blows a lot of the other notes right out of the water. I still have a couple of other books on the shelf here I should look through but what would be really interesting would be to better understand the Spies family and the Wolfe family associations. Bezdek may have more notes in books I do not own. Other titles as well may have their own basic bio for Spies. Something else I have run into is memorandum, letters, lawsuits, politics and benevolence of being a NYC businessman. I should plow back through the Horace Greely book of history regarding American industry and all in time I guess. I sure would like to find the autobiography mention in the Times obit and I may find more notes in looking through other avenues such as his partnerships and activity such as the fire department. I am also adding this abstract from Donnelly's listing as purely educational because this "bio" seems to get used from one book or another....stamped "A.W. SPIES" on back. Iron stirrup guard with original wood grip retaining original wire wrap .....Adam W. Spies emigrated from England to New York city in 1827, where he used his Birmingham connections to import military goods. He became closely associated with the large New York firm of C&J.D. Wolfe, marrying J.D. Wolfe's daughters. Last edited by Glen C.; 08-02-2010 at 08:20 AM. Have you ever seen a piece, noted and bookmarked it, then forget entirely what it was you were looking at and where to find it? After about three months and revisiting a site many times, I finally found it again (yippee). I was close in thinking I remembered a back strapped eaglehead and it must have been a Horstmann marked example with a chain guard. It turned out to have been a Spies marked spadroon with a fancy chain scabbard hanger. I was close huh (not)? Both the one I thought was it and this Spies both have serious hilt issues but I digress. What makes it relevant to this search for Spies as an agent of Birmingham goods is that this blade is showing its tang stamp. Does anyone recognize this? I am pretty sure the entire sword was English made. I imagine just the tang stamps from various forges is worth a treatise all by itself. I am forgoing attaching all of the sword's pictures but I will add that it is a mixed b&g with white etching panels. Continuing in watching Spies marked swords and their parallel, some neato ball carrying eagles have popped up lately. Also another example of this previous scabbard and chain set but this time on an ecthed vs b&g blade. These later swords (as had some of the earlier patterns) seem to have been funneled through Salter. The eagles attributed to Salter range from the early reed grips to the later militia types. I actually have quite a few more types and examples that may get added here. I am trying to be sensitive though if any owners see their pictures appear here. It is purely for educational purposes and I will remove any if requested to by the author of the images. This association of Spies and the overall scope of import/export is still a somewhat erstwhile chapter but both New York and the English sources still ened a lot more research with sound detail. The swords we have found bearing JS on the spine appear to have been marked by the Salter consortium on the English side (he was certainly an agent more than just a cutler producing finished swords, just like Ketland earlier). Last edited by Glen C.; 08-09-2011 at 11:08 AM. So, this trend that appeared in my searches the pst few months have shown some of these same hilt parts repeating on three distinct eagle variations, all marked to Spies. My initial start in this thread a year ago was not to just offer a picture gallery of Spies swords but here are some more eagles which I will follow with some dove head pommels and even a folding knife. Last edited by Glen C.; 08-09-2011 at 11:09 AM. There is an interesting broadsword bladed eagle still moving through the market I want to label as a Spies but have no firm indication it is. Here are some of the other hilts and the folding knife marked by Spies. More and more I still believe there were two generations bridging the gap between pre 1812 and then the later Spies returning from England after his tutelage and associations as an agent of goods. In my last post, I mentioned a broadsword bladed eaglehead and somehow needed to see it in hand to look at trends further. Although this example is not marked to Ames, the work appears to be very much as some other Spies marked British made hilts. This sword appears in the Medicus collection book on plate 47. The 47f example is blue&gilt rather than ths one that was white etched. 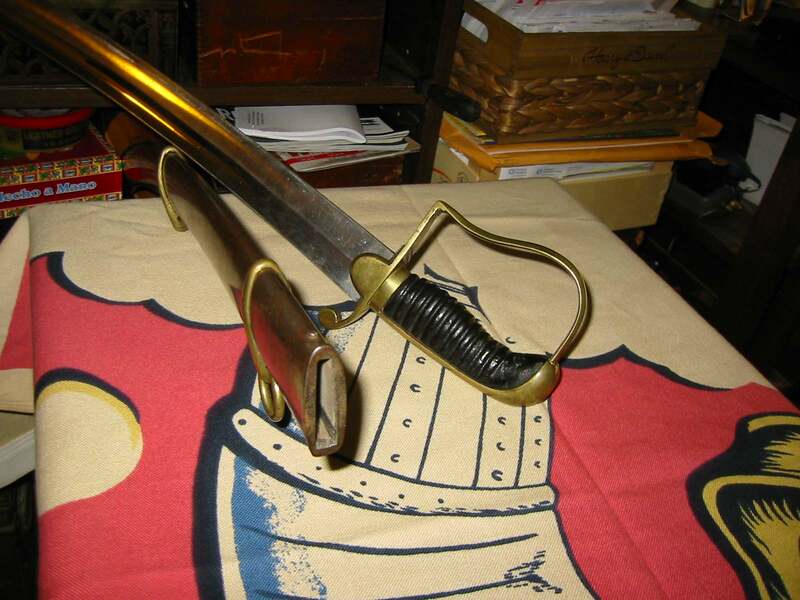 Another diffrence to the book sword is that this one was never silver plated and to me looks like English gilt. I and another had a feeling it might ring true to Ames but the etching doesn't add up, as the stars appear as a cloud instead of the crescent above the eagle as in so many Ames etches. 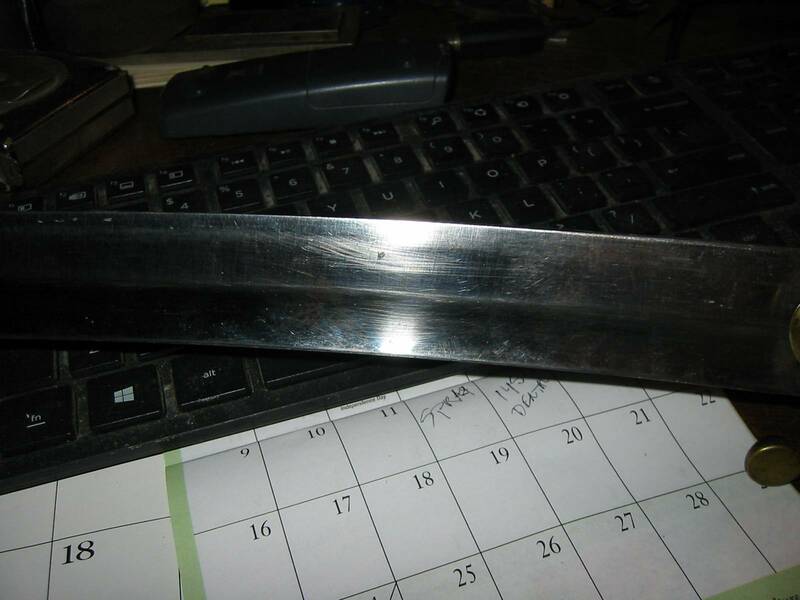 A perfect match to the blade and etch comes to light from my files and an old listing of a pistol grip militia sword. Something did always seem just too perfect about it. There is an old Ames article on the Man At Arms archives wherein it is mentioned that copies of Ames types were arriving in America s almost perfect duplicates. Anyway, a little more for this small look at American import agents and in still finding new match ups every day. This one quite well marked and preserved, a full spadroon blade and a variety that has become rather iconic in my files. I have to say this is about the best example I have seen in completeness, aside from the chain hanger that seems to have been common to these Spies metal scabbards. No more real notes forthcoming at this point. I am sure there are more tidbits to be found in exhaustive research and I guess it really is time to try to find connections and records of Spies in England. I am still somewhat erstwhile in my cataloging of eagles without replicating other's work. The basework is really already there, waiting to be fully applied to new information. Hotspur; a rather classic assembly of features that are quite retro for the time Spies was selling these. Was there an elder A.W. Spies we are maybe overlooking? This would certainly help explain the disconnect in bio facts such as the birth/death dates in Post 6 (i.e. 1783 to 1870) and could also explain the Spies name appearing on swords like that pictured in the initial post whose style seem to significantly predate Adam William Spies entry into the sword merchandising business. In researching my family tree I have run across a lot of instances of the conjoining two individuals in a single biography. Often the tip-off is an improbably long life and the suspicious dates of birth of some of the children, i.e. when both parents would have been senior citizens. I did a quick search on A.W. Spies on Ancestry.com. There really wasn't much new data available, but did establish his father was not another A. W. Spies, but rather John Spies (1763-1808). No information is available on any uncles or older cousins who might be another "A.W. Spies", perhaps one with birth/death dates of 1783/1870. In that case, we need a bio for A.W.Spies senior As the Wolfe marked Ketland type can certainly be associated with the 1820s (and others like the dragoon embellished sword above), I really don't have an issue with AW as we know him to have been importing swords with his name after his apprenticeship with the Wolfe family and in that same window of time once he came of age 1820>. To explain both the Wolfe's and Spies "old style" swords before the war really needs better information from Birmingham records, as well as more complete histories of NYC. Also note that the relic above with the distorted hilt and no grip had recently traveled through Ebay, years after it had been at a dealer. I always get a hoot seeing old friends. During a recent purchase, I had revisited The Wolfe and Spies association a bit. Hartzler had added some more paragraphs in his recent vol II. As confused as ever, the AW Spies notes seem to definitely relate two different AW Spies in NY but perhaps not. Is it is possible he married more than once? At any rate, the topic today relates the recent purchase of a new/old stock British made cavalry sword marked to the Wolfe cousins. As crisp as new overall, only the near 200 years has shown oxidation of the scabbard, hilt and shrinkage of the grip. The blade is remarkably free of any contact. Brass fittings on this P guard type. Showing the lack of continued distal taper refinement, this product of the 1820s has a very linear distal taper. A blade that is just 7mm at the guard, 5mm at the (8") pob, 4mm at the end of the fuller and 2mm behind the point. You'd think a pob of 8" would be off putting but with a weight of 1lb12oz, really quite handy and typical in its toylike presence overall (compared to a big line cavalry piece). 37mm wide at the guard and 32mm wide at the pop (belly) of the blade. The original seated washer is present and the fit to the scabbard perfect. A 32" blade puts it in the same territory as a British 1796 lc, and in turn handles a lot like my Starr 1818 trooper sword. With brass fittings, likely targeted for the mounted artillery roll. British made (almost without doubt) The Wolfe and Spies firms were deep in trade with British exporters. This is a third purchase from J&J Militaria, through his ebay sales. An urn pommel sabre from him had been similarly found in unused, pristine condition. The mounted artillery sabre I had bought from him years before that was bought specifically as a mat cutting sword but similar in many ways. The latter German made, I believe and a little longer. Sharp and sound as a bell. Snippets of the two newer Hartzler titles are viewable on Google books. With e-books quite inexpensive, it is tempting but I'd rather save for the hard books. Lots of (new to me) NYC info and I'm sure much more. The Wolfe and Spies information there as complete and concise as I have seen in one place but there is still the whole chapter of Spies in England that could probably reveal a great deal regarding English export to the USA during the first half if the 19th century. Thanks for viewing, and as always, more is less as far as I am concerned. Bring out your Wolfe and Spies lore, as well as marked swords. I would have started a Wolfe specific thread but the two families are forever intertwined. I don't see Bruce Bazelon's Directory of Military Good Dealers mentioned here. Because Spies was basically that, he is covered in great detail. You may need both volumes... the books are a little confusing to use because Volume II only included information found after the publication of Volume I. Thus, some makers are in both volumes and you need to read both citations. All of these NY military hardware dealers are covered extensively and, more to the point, Bruce used only primary sources. I'll definitely check out the Bazelon volumes. I was disappointed with his Horstmann book, in that it is just that, basically the old title Horstmann had published. I see a combined edition on Amazon. Is this truly both volumes in one? This is outside my knowledge but not my curiosity. I have never been satisfied with any dating for Spies or Wolfe but have no opinion at this time. Hopefully my swords will move the conservation along as it is a most interesting thread. I have one more silver hilt to post simply marked JW on hilt. More time tomorrow. I do not know it to be J. Wolfe but have found no other makers in time frame, or rather close with a JW. First things first two stamped C and JD Wolfe swords a Ketland style spadroon, guard repaired by me. 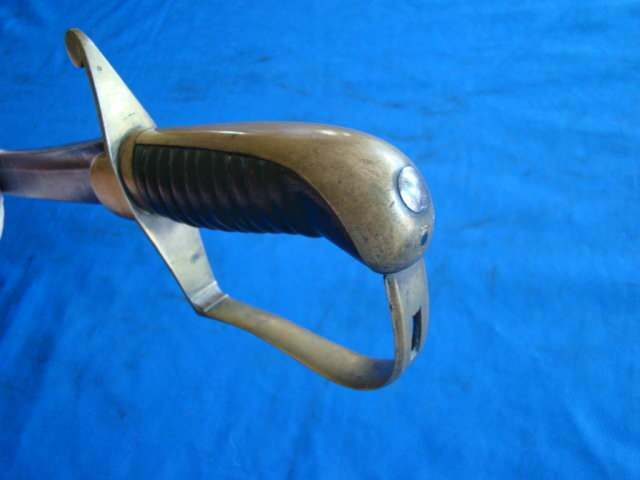 Pommel, grip, blade and part of guard original. Also a French style saber marked to Wolfe. The sabre is a curious piece Eric. With the fitting of the grip and having looked at other photos of it, some repair must have been done at some point. What does the peen look like? Be that as it might be, there is still a current ebay listing of a screamer listed as Ames that has a Spies like guard (whaaaaa??????? ). Fairly professionally looking furbished, it kind of opens the door again regarding someone next door needing a blade or parts to fill an order (Bazelon and import blades notwithstanding). I have seen Ketland types and Osborn types listed to both Spies and Wolfe. Your spadroon is is new one to me, as most of the Wolfe examples I see are sabres. I am interested in seeing your JW marked silver hilt. The grip is a definite repair, alteration or special order. I believe it is a replacement for a damaged grip. I will try to get a photo of peen later. I am not sure what metal the grip is as it seems to be some sort of silver alloy. I am usually fairly good at identifying metals but am stumped a bit on this one.